He kanohi kitea, he hokinga mahara. To see a face is to stir the memory. 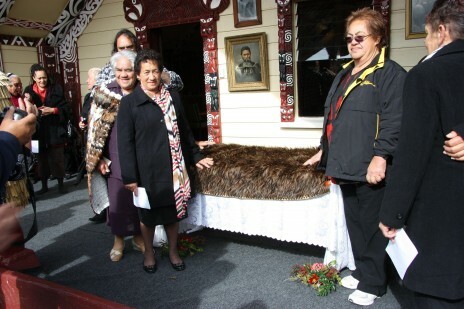 On Sunday 6 May 2012, a beautiful kahu kiwi cloak from the Te Papa collection, was named by her descendants as part of a special church service held at Rongomaraeroa marae, Porangahau. Te Papa Press recently published a cloak book Whatu Kākahu: Māori Cloaks edited by Awhina Tamarapa, Māori Curator. The cover of the book features a detailed image of this stunning kahu kiwi. Part of the research for this book included liaison with weavers, textile experts, researchers and descendants to bring together information on the cloaks held by Te Papa. We were fortunate to have the guidance of Professor Piri Sciascia from Victoria University, Wellington for this particular kahu kiwi. How the cloak came into the museum collection was pieced together from archival records. Piri, his sister Marina, and their whanaunga Morehu Tūtaki, gave the history and whakapapa of their tipuna whom the cloak originally belonged to – an amazing wahine Rangatira- Rāwinia Ngāwaka Tūkeke. Her story and the journey of her cloak unfolded. The journey home of Rawinia’s kahu kiwi after more than 150 years away was an emotional and joyous occasion. The whānau of Ngāti Kere, Ngāti Pihere, Ngāti Manuhiri, Ngāti Hinetewai and members of the Porangahau St Hill-Warren and Lambert families connected to the cloak’s history, welcomed Te Papa representatives with the pōwhiri onto the marae. Te Papa was led by Tainui iwi resident kaumātua Taki and Ratau Turner, with Hema Temara and Tamati Cairns from Ngāi Tūhoe. Te Herekiekie Herewini and Mark Sykes were the cloak’s couriers. Awhina Tamarapa and Hawke’s Bay Museum kaitiaki Tryphena Cracknell carried the cloak to the mahau of the wharenui during the pōwhiri. The sun peeked out and the mist rose, during the whaikōrero. Soft rain fell while the people gathered inside for the church service. “Kei te heke ngā roimata o Ranginui” – tears of happiness were shed”. A taonga returns to be with her people. Descendants of Rāwinia Ngāwaka Tūkeke gather around the kahu kiwi before the blessing inside the wharenui Te Poho o Kahungunu. Rongomaraeroa marae, Porangahau. 6 May 2012. Photographer Mark Sykes, Te Papa. The blessing service inside the wharenui Te Poho o Kahungunu was led by Reverend Harriet Cutbush and Reverend Leo Te Kira. The cloak was carried into the wharenui by Ashton St Hill-Warren and placed on a table at the front of the assembly. During the service, Rāwinia’s cloak was named ‘Pīata’, meaning ‘to shine, to glisten’, by Morehu Tūtaki. Pīata was the name of Rāwinia’s mother. Such a powerful, symbolic act, transcends the physical world. All present witnessed the spiritual and cultural reinstatement of the people to their taonga. ‘Piata’ remains a beautiful and precious symbol of their whakapapa and the community’s entwined relationships, which completed a full circle that day. ‘Piata’ will be on display in the upcoming Te Papa cloak exhibition Kahu Ora Living Cloaks, which opens on Friday 8 June. Piri’s daughter Atareta, has been photographed wearing ‘Pīata’ as the main promotional image for the exhibition. Our thanks and best wishes to the people of Porangahau, and for all those that contributed to the day. E kore e kitea ngā kokona o te ngakau. The corners of the heart cannot be seen.